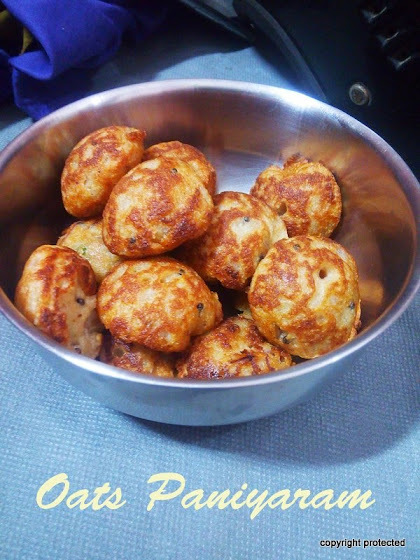 Paniyaram - also called Gunta Ponganalu is a popular breakfast dish in Andhra and a regular item in my weekly menu. It is usually made using dosa batter. This instant paniyaram dish is a slight variation from the usual paniyaram. Here instant oats and rava/semolina are used. It is quite delicious and healthy too. This comes in handy during morning rush or when you have guests at home. Dry roast oats and rava separately for 2 mins until the color changes a little bit. Do not roast them too much. Set aside to cool and grind them together in a mixer to a coarse powder. Take the powdered oats and rava in a bowl. To this add the rice flour, salt and curd and mix well. Add enough water to it and mix to get the consistency of dosa batter. Set aside for 15-20 mins. Heat 1 tsp oil in a pan and add mustard seeds. When they start to splutter, add urad dal, channa dal and curry leaves. When the dal turns light brown, add onion, green chillies, curry leaves and saute till the onion turns transparent. Add these seasoned ingredients and the cooking soda to the batter and mix well. 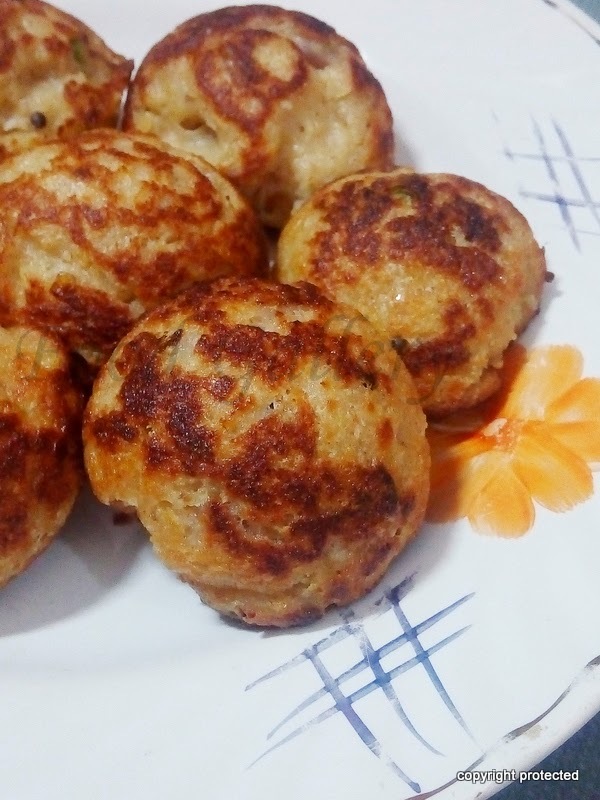 (The cooking soda should be added just before making the paniyaram). Heat the paniyaram pan and add 1/2 tsp of oil in each hole. When it gets piping hot, turn the flame to low and add the batter to each hole till it fills 3/4th of the hole. Cook covered for a minute. When the top part looks cooked or the edges start to turn golden in color, gently flip to the other side and cook till golden brown. Remove them fire. Repeat the same for the rest of the batter. Yummy Oats Paniyaram is now ready. 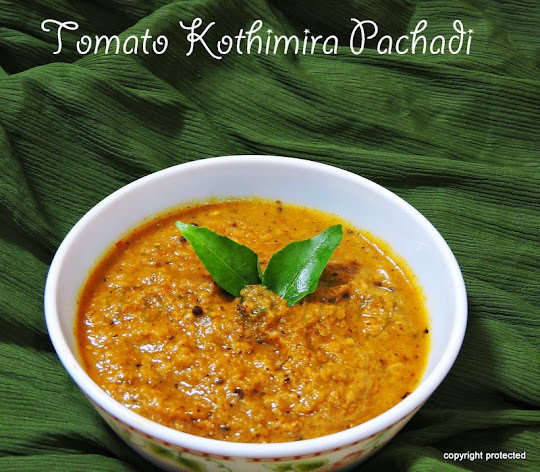 Serve with coconut chutney, onion chutney, peanut chutney or any other chutney of your choice. Its a very nice recipe. Very easy to cook and ingredients are easily available n the market.